A customer shops for produce in Montreal. The average Canadian family will pay about $400 more for groceries and roughly $150 more for dining out next year, an annual food-price report predicts. 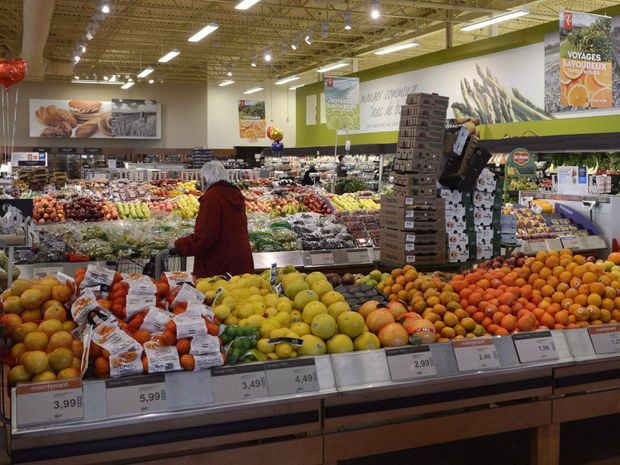 Food prices will rise between 1.5 per cent to 3.5 per cent in 2019, according to the report from researchers at the University of Guelph and Dalhousie University. That means the average family of four will spend $12,157 next year – up $411 from 2018. Vegetables will see the biggest price jumps – between 4 per cent and 6 per cent for the category, according to the report. Meanwhile, meat and seafood prices are expected to fall, with the meat category to decline by 1 per cent to 3 per cent and seafood costs to remain the same or fall up to 2 per cent. Since 2015, the team has predicted prices in those two categories would rise as high as 6 per cent each year. “This is a bit of a risk for us. … We’ve never done that,” said Sylvain Charlebois, one of the lead researchers and a professor at Dalhousie University, referring to anticipating a decline. At the same time, fast-food chains have started adding vegan and vegetarian options to their menus. A&W Food Services of Canada Inc. even temporarily sold out of its Beyond Meat patties shortly after adding them to its menu. A turning point for animal protein, though, was 2014 when beef prices started to rise dramatically, Dr. Charlebois said. Between December, 2013, and December, 2014, the monthly average retail price for one kilogram of ground beef rose more than 26 per cent, according to Statistics Canada data. For comparison, the price advanced about 3.5 per cent from December, 2012, to December, 2013. It reached a record high of $13.23 in October, 2015. “It really spooked consumers,” said Dr. Charlebois, adding they started substituting plant-based protein into their diet. They’re particularly influenced by climactic events, such as the El Niño expected to occur this winter, he said, which can result in warmer and drier conditions, and create shortages in the supply chain. As far as which vegetables may see the biggest increases, it’s difficult to know what produce item will become the next cauliflower, Dr. Charlebois said. The cruciferous vegetable saw soaring prices per head in 2016. Dr. Charlebois points to lettuce and tomatoes as possible candidates for big price fluctuations. Meanwhile, Dr. Somogyi said produce imported into Canada is more susceptible to weather events and the corresponding price changes. The report predicts more modest increases for bakery (1 per cent to 3 per cent), dairy (0 per cent to 2 per cent), fruit (1 per cent to 3 per cent) and other food items, such as non-perishables, not covered by the other categories (0 per cent to 2 per cent). The researchers’ predictions for 2018 were fairly accurate. Fruit prices, which they estimated would rise between one to three per cent, stayed stagnant – the only category where they missed the mark.